Up, Up, Up! 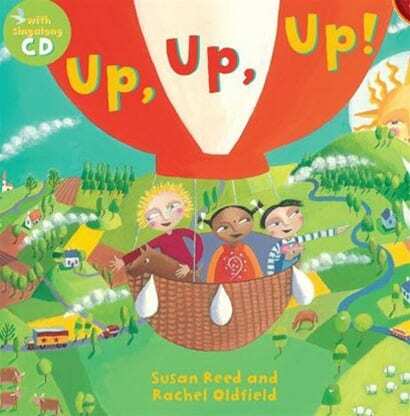 by Susan Reed and illustrated by Rachel Oldfield is a new favourite in my household. From the moment I took it out of the box, Sadie has barely put it down. And not only is it a book, but it also comes with a sing along CD. How cool is that? 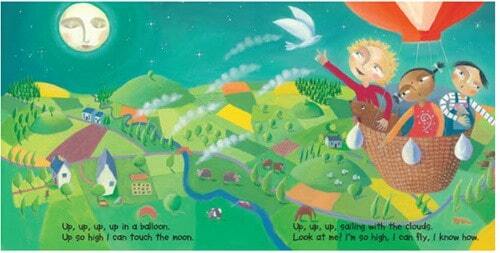 The book is about a adventure taken in the sky in a hot air balloon. It talks about all the things we can do down on the ground, but nothing beats flying through the air looking down over everything just like the birds do. The pictures are great! Everything is so cheery and happy and the color scheme is wonderful. It really grabs and keeps Sadie’s attention through the whole book. You can see different backgrounds of people, different cultures and different ways of life. We love the CD as well that is sung by Susan and her daughters. It’s a very catchy tune and you can’t help but tap your toes and clap your hands. Very folk like and easy to learn so that when you get to the sing a long part you can sing the words by following along in the book. It really is neat and a nice change from just ready a simply book. This book will be on my to get list for my favourite kids out there as I think all ages will enjoy it. You can check it out at EcoMom.com. Up, Up, Up! retails for $17 and is geared for ages 3-7, but I think everyone will love it. I want some plum organics mish mash! I really like the Under the Nile Lion, he looks soft and cuddly!